The number one thing I tell everyone who wants to up their barbecue and grilling game is that they need to own a quality instant read thermometer. With the price of beef continuously going up, you don’t want to be overcooking and ruining your prime grade ribeye, and you don’t want to be under cooking that chicken breast, either. Anyway, the number one benefit of owning an instant read thermometer is the complete removal of any guesswork. All food will be cooked to safe temperatures throughout, and also perfectly to your chosen level of doneness. Consistently good results can only be achieved by being able to measure the internal temperature of your food precisely. Throughout this article, we’re going to dig a little deeper to explain exactly why we think you NEED an instant-read digital thermometer. We’ll also cover what it is you should look for when choosing one, then quickly recommend and review some of the best and most popular models on the market, before ending with some best practices to care for your unit. Who Needs a Digital Thermometer? In the following video, the good people at Reviewed.com help us understand the basics of why you would want an instant-read thermometer and what to look for when purchasing one. They also speak of the highlights of some of the units we’re going to review later in the article. For such a basic tool, there is little in my arsenal of cooking gadgets that outperforms my instant read digital thermometer when it comes to being essential. It has easily improved my cooking skills more than any other tool by allowing my cooking to be more accurate and consistent. With an instant-read thermometer, there is no more cutting open steaks or chicken to check if it is either safe to eat, or done to my liking. Regardless of what the recipe may tell you, the food is not cooked in five minutes, the food is cooked when it reaches the right internal temperature. In short, an instant-read digital thermometer will quickly inform you what is going on inside your food, so you don’t ever have to guess and will rarely if ever get it wrong. No more serving undercooked unsafe to eat meat, or overcooked, dry boot leather. It is my firm opinion that anyone who cooks meat needs an instant-read digital thermometer. That is inclusive of both grill masters and master cooks who never venture outside. Sure, there’s always that one guy who comes to the cookout, watches you grilling steaks, and gives lots of unsolicited advice. He swears by “this neat trick my Uncle taught me,” and proceeds to demonstrate how different parts of his hand mimic the doneness of the steak. Don’t even get me started on this one! Listen, this is plain false. The fact of the matter is a chubbier cook is going to have a fleshier hand than a skinnier cook. Their hands are not going to feel the same. Which brings me to my point: unless you use a quality thermometer you are guessing the internal temp of the meat. If you’re cooking steaks to order, or you are serving meat that has to reach a specific temperature to be safe, like chicken breast or a turkey burger, you don’t want to be guessing if it’s done, do you? For the health and safety of the people eating, you need to be sure. Thanks to digital thermometers it’s now easier than ever to know the internal temperature of the meat. Before digital thermometers, there were only analog thermometers. Basically a probe with a dial thermometer at the end. And while they got the job done, they are no match to even the most basic of digital thermometers. Even the best and most expensive analog thermometers take far, far longer to sense and settle into a proper reading and display it, when compared to their digital counterparts. On top of this, anything but the most expensive analog thermometers aren’t known for being nearly as accurate as modern digital models, and don’t offer much more than an estimated temperature range. With so many different models in the market, it can be a challenge to know what exactly to look for when you go shopping for a digital thermometer. Before you go out and purchase the first unit you come across, here’s a quick rundown of the types of considerations you should keep in mind when shopping. Before all else, you want a thermometer that’s accurate, and can either be calibrated by yourself, or comes with a guarantee of accuracy and can be calibrated by the manufacturer in the rare event it needs performing. Accuracy is the single most important thing! It’s no good to you if it fools you into thinking your steak is medium rare when it’s the wrong side of rare or well done. While not as important as accuracy, you want to be able to read your temperature and move on quickly. The longer you’re standing with the lid to your grill open, the more heat is escaping, the more any charcoal or wood fire then fluctuate once the lid is closed again, and the less consistent your cook. Not to mention slower. How high and low do you want to be able to read with your thermometer? Obviously, if you’re going to be cooking steaks, you need to be able to read at least 145°F, but if you’re cooking brisket or pork shoulder, you’ll want to be able to read to 205°F. If you want to use your thermometer to help you make candy, you’re going to want to be able to read even higher temps. So make sure you buy a thermometer that will be able to measure all the temperatures you ever plan to test with it. Just like all modern accessories and gadgets, there are some great features available that can take a thermometer from merely good to truly great. Most thermometers can go from Celsius to Fahrenheit with the push of a button. Many have backlit displays which make cooking outside at night easier, and some backlit displays are automatic, turning on on their own when the light levels fall. Some models have displays that auto-rotate to make it easier to read from every angle. Some display temperatures in tenths of a degree for super accuracy. And some are waterproof which means you don’t have to worry about getting them wet. Decide which features really matter to you, but be aware that with every desirable feature you add, you generally speaking have to pay extra. The last – but still important – thing to consider is how easy it is to use. When you’re in a hurry with a hoard of hungry family members waiting for dinner, or you’re juggling three grills, four types of meat, six sides and more, you don’t want to be fumbling with your thermometer. You want to be able to easily turn it on, use it, and put it away without any fuss. These are, in our opinion, 8 of the best, most feature packed, durable and good value for money instant read thermometers on the market today. There’s sure to be one to suit all budgets and requirements in this list. The Lavatools Javelin Pro is an excellent thermometer at an affordable price. If you’ve never used a thermometer before and you’re unsure if you want to shell out big bucks for one, this is a great choice. The manufacturers’ website boasts great accuracy at ± 0.9°F. You’re not going to have to worry about overcooking your steaks or serving under-cooked poultry with this unit. In addition to being super accurate, the Javelin Pro is able to read the temperature of food in as little as 2 – 3 seconds. Great if you’re looking to check your steaks quickly and you don’t want to let too much heat escape your grill. With a wide temperature range of -40°F to ~482°F (-40°C to ~250°C) there is very little this unit can’t be used for in the kitchen, let alone grilling. If you use a deep fryer and you need to know the temp of your oil, the Javelin Pro can handle this task as well. All signs point to a quality thermometer that will last you a few years of regular use. With a 3-year limited manufacturers’ warranty, you have the comfort of knowing the company is standing behind their product. Out of all of the thermometers we looked at, we feel the Javelin Pro comes with the most features out of the box. Our favorite is the “Intelligent Stabilization Alert + Temperature Hold” – in other words, the unit will beep to let you know it has completed reading the temp of the meat. There is also a backlit display that will automatically notice when it’s too dark to read the unit and turn itself on. There’s a magnet built into the unit, so it’s easier to store. Auto shut off if left open to conserve battery life, as well as a large auto rotating display, meaning you can use this unit with either your left or right hand with ease. Finally, it can display temperatures in either Fahrenheit or Celsius. With no confusing display, and a unit that automatically turns on/off, and an auto backlit display, this unit is a breeze to operate requiring nothing from you but the ability to read numbers. The simplistic design, ease of operation, 3-year warranty, and the low-end price are all things we think make this a great unit. The unit is large and bulky, and the hinge can be stiff to open. In other words, you’re going to need both hands to use this thermometer which isn’t a big problem, so long as you have somewhere safe to lay down your beer first. If you’re looking for an accurate, superfast thermometer, with lots of added features at a low price, this is the unit for you. If you’re looking for a rugged unit that’s going to be built to last the rest of your days, or if you are looking for a unit that is a little more basic, you may want to keep looking. All in all, this is a great thermometer at a low budget. Despite its peculiar name, the Mister Chefer thermometer is another low priced option that comes with some nice extras. It has all the necessary functions you would need in an instant-read thermometer. The Mister Chefer is accurate to ±1°F, which is very respectable. With an average reading time of 3 – 4 seconds it’s not the quickest of thermometers, but it’s still fast enough not to be a hindrance to effective regular use. You won’t be all day waiting to find out how much longer your pork shoulder needs to cook for while your heat is escaping the grill. Much like many of the thermometers on this list, the Mister Chefer has a wide temperature range from -58℉ to 572℉, meaning you can do a lot more than cook on the grill or smoker with this thing. 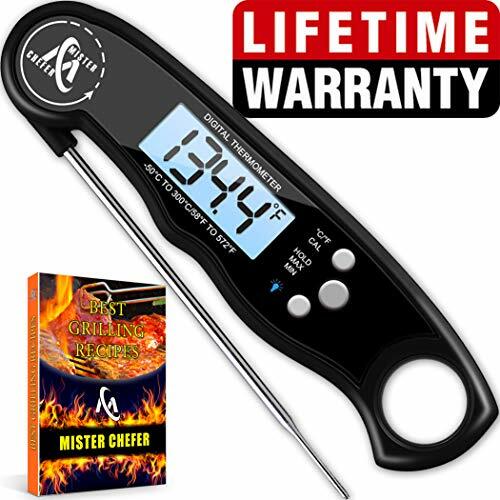 With its low price point, you tend not to expect a lot from a thermometer with as many features as the Mister Chefer, but it does come with a lifetime warranty, and a 100% money back guarantee from the manufacturer. The manufacturer claims the unit is waterproof. This unit comes with a handy button-activated backlit display. Perhaps not as nice as an automatic one, but still a very nice feature. It also has a button to ‘hold’ the temperature for easier reading even after the probe has been pulled from the food. You’re able to calibrate this unit yourself to ensure it’s accuracy over time which is a nice feature, and additionally it has a built-in magnet and hoop for easy storage. Finally, it has selectable temperature display at the push of a button, to choose between Fahrenheit or Celsius. Note: For more information on how to do this, check out our article on calibrating thermometers. With a simple auto-on/off feature, this thermometer couldn’t be easier to use. Simply open the probe, and the unit turns on and is ready to use. When finished, close the probe, and it turns itself off. There’s a lot to like about a cheap thermometer that comes with ample features like backlit display and auto on/off. Heck, this unit is probably cheaper than most analog thermometers while being a lot more reliable. It would be easier to use if the display rotated. With its current design, it would be difficult to use if you are left-handed. Basically, if you don’t have a large budget, but you want an accurate and quick thermometer, this is the unit for you. If you’re looking for a solid thermometer to last a lifetime, you may want to consider one of the more premium models. You simply couldn’t have a list of great digital thermometers and not bring up the amazing Thermoworks Thermapen MK4. This unit is considered by many to be the Gold Standard when it comes to digital instant-read thermometers and the unit that is arguably most copied on the market. This unit is the most accurate one on our list, coming in at ±0.7°F of the exact temperature. The MK4 is also one of the fastest thermometers on our list, with a rate of 2 – 3 seconds reading time. 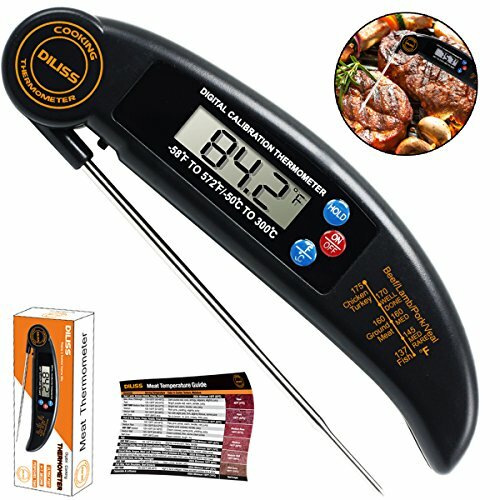 With this bad boy, you’ll be able to quickly and accurately tell the temp of your steaks and chops in no time. With one of the most extensive ranges in this list, the MK4 has a temperature range of -58.0 to 572.0°F. This means you’ll be able to use this unit for many other things outside of grilling and barbecue. As mentioned, this model is the gold standard of the instant read digital thermometers. One of the main reasons for that distinction is because this unit is very rugged and durable. Hard resin plastic on the outside, and with a design that is waterproof, you need not worry about longevity with this model. If dropped, onto the floor or into water, this unit survives. The Thermapen MK4 features a rotating display, so no matter which hand you hold it with, or how you tilt it you can still clearly read the temp. The unit automatically turns on when the probe is opened and automatically turns off when closed. Also If you forget to close the probe, it will automatically turn off after a few minutes, and turn back on when you pick it up. This is a great feature that extends the average battery life to the fullest. Finally, the backlit display will automatically turn on when it senses it’s in a low light environment, and there are buttons in the battery compartment that allow you to change between degrees C and degrees F.
The Thermapen MK4 is incredibly simple to use. Just open the probe, and it turns off, insert the probe int your food, read the temp within 2 seconds, close to turn off. Even if you forget to close the probe, it’ll still turn itself off to save battery. The rugged build of this unit, combined with the incredibly fast and accurate reading make this unit a no-brainer. Factor in the added features and you’ll wonder how you managed to get by without one all these years. While it is hard to find fault with this unit, the heavy price tag compared to some on this list make it a bit hard to swallow for many. 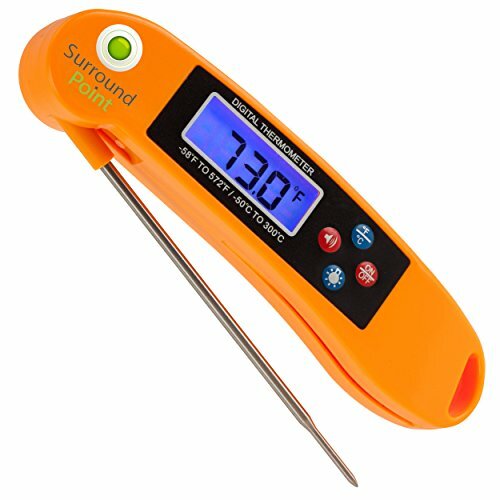 If you are looking for the hands down, best instant read thermometer on the market right now, and you do not care how expensive it is; this is the unit for you. If you’re shopping on a budget, or if you simply do not need some of the extra features we’ve spoken of, then you should consider a cheaper model. But hey, there are reasons that the Thermapen is the model you see on every episode of BBQ Pitmasters and every Food Network show. The little brother to the Lavatools Javelin Pro thermometer discussed above, this unit is basically the bare bones equivalent with fewer features. Just like the Pro model above, the PT12 is accurate to within ±0.9°F, making this a very capable thermometer. This unit can read the internal temperature of meat in 3 – 4 seconds, just a tiny bit longer than the Pro. Just like the Pro, this model can read temperatures between -40°F to 482°F. So if you’re looking to use this unit to grill, barbecue, make candy or brew beer, it will get the job done. Built with the same quality as its big brother, this unit also offers a splash-proof design. This is where the PT12 falls down when compared to the Pro. The PT12 doesn’t offer nearly as many features, it’s a bare-bones unit offering just a built-in magnet and an auto-off function when you open and close the probe. As a basic unit, it’s easy to operate with nothing that can possibly confuse. Simply open the probe and the unit turns on. It doesn’t have a rotating or backlit display. This compact unit is great bang for your buck with an accurate and fast reading, all for a great low price. We wish the PT12 had a backlit display for night time grilling because when smoking a large cut like a brisket or pork shoulder, it’s inevitable you’ll sometimes be grilling in the dark. Also, a rotating display would make it easier to read. If you’re shopping on a budget, looking for a bare-bones unit that is still fast and more than capable, or you’re simply looking for a second thermometer to have a back-up, this is the unit for you. If you want all the features that come standard in the Javelin Pro, then you should buy that model and not be disappointed. This unit is an interesting piece of kit that differs to most on this list. It is a dual function unit, able to both read the internal temp of the meat by a probe, but can also read surface temperatures thanks to the included infrared thermometer. In other words, you will be able to read the temp of surfaces to determine their temperature, making sure it’s hot enough before you start searing meat, or put your pizza onto a stone. The accuracy of this unit varies depending on the temperature: below 14°F – ±2°F; 14°F to 149°F ±1°F; Above 149°F ±1% of the temperature being read. With what has to be one of the fastest reading times I’ve ever seen, both the infrared and thermocouple thermometers can read within 1 second. Again, the temperature range varies. The infrared temperature ranges from -67° to 482°F. While the thermocouple temperature ranges from -67°F to 626°F. Taylor is a trusted brand name that has been manufacturing thermometers for over 150 years. Like most of their products, this thermometer is a high-quality construction, built to last. The biggest feature is obviously the included infrared thermometer that allows us to measure both the internal temp and the surface temp. There are also three LED lights on the face of the thermometer to let you know if the temperature you are reading is either food safe for hot or cold holding, or if it’s somewhere in the middle. There’s also a hold setting, to freeze the last read temp, and an auto shut-off to save battery. This unit requires a bit more work to operate, but once you understand how it works, you shouldn’t have any issues. To measure the internal temp of the meat, open the probe, press the green “Probe” button, and it will automatically measure your temp. To measure the surface temp, hold the infrared lens a couple of inches away from the surface you want to measure. Press the red “Scan” button, and a white light becomes visible to show it’s reading the temperature. Very clearly we like the fact you can measure both internal and surface temperatures with this tool. The lack of a backlit screen is a bit of a let-down for a thermometer that has so many forward-thinking options. It would also be nice if the screen were bigger and easier to read. If you’re looking for a thermometer you can use to measure both the internal and surface temp, this unit offers excellent value. If you already own an infrared thermometer, it wouldn’t be necessary to purchase a thermometer like this that offers both. This is a great thermometer for the money. It is essentially like you’re getting two for the price of one. The Surround Point Digital Thermometer is a nice thermometer at a lower price point. It does have a neat feature where it will actually speak out the temperature reading, so is good for those who are visually impaired. The probe has an accuracy of ±1°F, so you can take your temperature reading with confidence. Like most all the thermometers we’re looking at, it has a fast reading time of approx. 4 seconds. Also like most thermometers, this unit has a wide temperature range of -58℉ to 572℉. This unit is one of the cheaper ones on our list, so I feel obliged to warn that you frequently get what you pay for in these scenarios. It should also be noted that the unit is not waterproof. As previously mentioned, this unit has the unique feature of being able to tell you out loud the temperature reading automatically. This is great if you’re trying to read temp in an awkward spot and can’t actually see the temperature reading. There is a simple on/off button, and another button to choose between displaying temps in Fahrenheit or Celsius. In addition, the unit has a backlit display (also push button) and automatically shuts itself off if left alone. By no means is this thermometer difficult to use, but there are some buttons on it you will need to operate to use it effectively. Essentially if you want to use the backlight or have the thermometer tell you aloud what the temperature is, you will need to press the clearly labeled buttons. The low price point and the neat feature where you can hear the temp at the push of a button are two really nice things we like about this model. While not deal breakers, it would be nice if the display could have rotated and that the unit was at the very least splash proof. On top of being a great choice for someone on a budget, this thermometer would be great for someone visually impaired who will benefit from being told the temperature reading audibly. If you wouldn’t either benefit or enjoy hearing the temperature read out, then this probably isn’t the model for you. Also, if you’re looking for a quality thermometer with more bells and whistles like a rotating display or being splash proof, this may not be the unit for you. In short, this is a great budget option and would probably make a nice backup thermometer for some. For more information and pricing, click here. This thermometer is definitely one of the best bangs for your buck, being one of the cheaper units on this list. Though as expected, it makes it very basic in what it offers with no frills or fuss. The folding probe can come within ±0.9°F accuracy making this thermometer just as capable as some of the more expensive models. The reading time is approx. 4 – 6 seconds which is on the higher end of the scale for the units in this list, but it still is plenty quick enough to be useful. 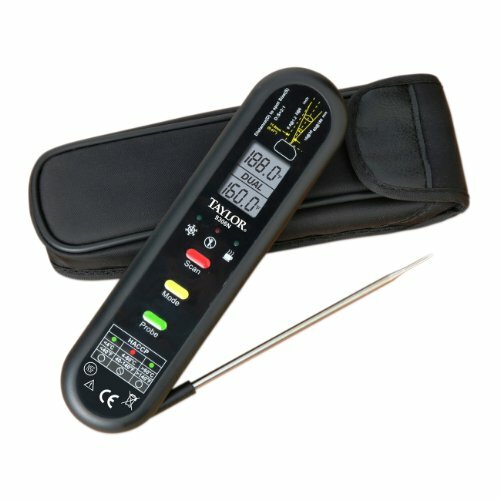 This model has a very wide range of -58℉ to 572℉, meaning you’ll be able to use this thermometer to check any meat temperature you wish. The manufacturer offers a lifetime warranty on this unit, so it’s safe to say that they’re confident in this unit’s durability. This model is pretty basic but still manages to have some nice features. A built-in magnet means it can be easily stored on your refrigerator for when you need it. The unit can turn itself off after 10 minutes and is splash proof. The hold button will freeze the temperature display to make it easier to read after removing the probe, another button selects between displaying temps in degrees F or degrees C, and there is a meat temperature chart printed right onto the thermometer so you never have to double check if your chicken is food safe or if your steak is medium rare. The thermometer is by no means complicated to use, there is a built-in auto on/off switch so when you open the probe it is on, close it and it’s off. The display is large and easy to read, and the unit automatically turns itself off if left open alone too long. Besides the price, the thing we like the most is that the temperature chart printed on the thermometer. A backlit display that rotates would be two really nice features we wish this unit had. If you’re looking for a quality thermometer that’s not going to break the bank, this is the unit for you. If you plan to be doing a lot of night-time grilling, you’d be better served with a unit with a backlit display. If you’re not, then you don’t really have anything to lose with this unit. The Thermopop is another thermometer made by Thermoworks, the people that make the Thermapen, and while it’s still a great little thermometer, there are some stark differences between the two. Right out of the gate, the Thermopop is nowhere near as accurate as the Thermapen. The Thermopop is accurate to within ±2.0°F from -4°F to 248°F and ±4.0°F thereafter. The Thermopop is just a little bit slower than the Thermapen and can read temps in 3 – 4 seconds. 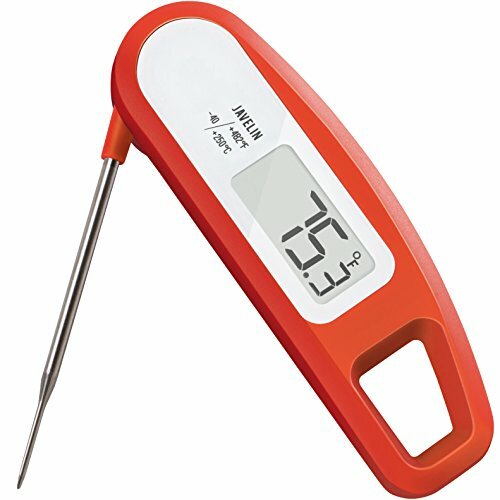 Like most all thermometers in this list, and exactly like the Thermapen, the Thermopop has a wide temperature range of -58°F to 572°F. Like all Thermoworks products, the Thermopop is a high-quality device designed for constant use in commercial kitchens. Even with its small size, the unit is packed with features. It has a large rotating backlit display and is splash proof. There are nine colors to choose from and it can be used in either the left or right hand. Because of the round design and the rotating display, this unit can be turned on and used by either the right or left hand with ease. Other than that, it’s such a simple unit, it oculdn’t be much easier. Put your probe into the food, and read the temp. This unit is definitely the best value in terms of getting a quality thermometer for the price. We also like the ease of use and the rotating display. While this unit is great and packed with features, we would really like if it was more accurate. This unit is designed for constant use in a commercial kitchen, but it is also great for someone who wants a quality thermometer for home, while not wanting to spend a lot of money. If you need to have a super accurate thermometer, or you want a large thermometer you can hold onto for an extended period of time, you may want to consider the Thermapen. Regardless of what unit you go with, you’re going to have a quality tool to add to your grilling arsenal. 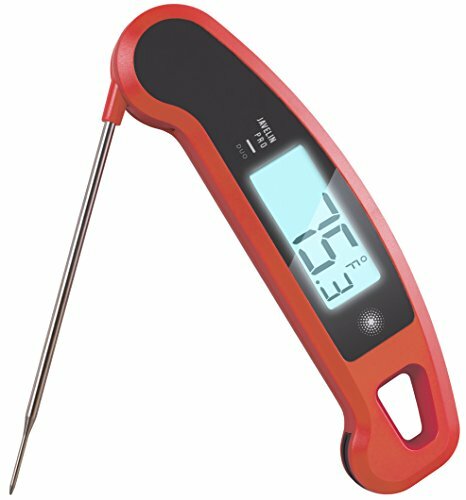 OK, so we’ve gone over what to look for in an instant-read thermometer, and reviewed some of the most popular models on the market, but how the heck do you use it? According to Christine Gallary, a graduate of Le Cordon Bleu and writer for Cook’s Illustrated, using a thermometer is undoubtedly not complicated, but there are some things to keep in mind. No matter the type of meat you’re attempting to measure the temperature of, you should always place the thermometer into the thickest part of the meat and keep the probe away from the bone. If you’re trying to read the temp of a skinny piece of meat like a hamburger or thin pork chop, turn the meat sideways and place the probe in lengthwise. It’s easier to make sure you hit the center and get an accurate reading this way. Lastly, you need to give your thermometer time to measure the temp so give it 4 or 5 seconds to finish reading the temperature. Not all thermometers can be calibrated without being returned to the manufacturer, but if you can, it would be a worthwhile practice to occasionally calibrate them to ensure they’re always operating in tip-top shape. Every thermometer will have a different process to calibrate them (if possible at all). You may have to simply push a button when the thermometer has reached a certain temp, or you may have a small dial to turn. Consult your thermometer’s owner’s manual for more information. You can check your thermometers calibration in one of two ways: you can boil water and make sure it reads 212°F, or you can place it in a bowl of ice water and make sure it reads 32°F. For a thermometer to last years – or a lifetime – you must know how to care for and protect your investment. We’ll start with cleaning it. Some thermometers are waterproof, and others are not, so you will need to be careful when cleaning. You may only be able to simply clean the tip of the probe with a damp cloth so not to damage the unit. But regardless of thermometer type, you should clean the probe after every use for hygiene reasons. You do not want to introduce germs and bacteria into your food when taking a reading. So, thoroughly clean your thermometer probe with soapy water after every use, but be mindful of the fact you should not get the body wet as it may malfunction. Next, don’t leave your thermometer outside for long periods of time. If it gets either too cold in winter, or too hot if left in direct sunlight, it can easily damage the internal electronics. Make sure the unit is turned off when stored away and be on the lookout for weak batteries. Once the batteries start to wear down, don’t hesitate to replace them with fresh ones because old batteries leak acid that damages the internals. The Thermoworks Thermapen MK4 takes the top spot in our list of instant-read thermometers. With a high-quality build, super-fast and accurate temperature readings, and long list of features, it simply can’t be beaten. Coming in a close second is the Lavatools Javelin Pro, which is almost as good and has a lot of the same features as the Thermapen, but for approximately half the price. What do you think? Did we miss any major thermometers on the market that should be included in this guide? Please leave us a comment below to let us know your thoughts. I use a meat thermometer pretty much every time, for outdoor cooking and in the kitchen. Certainly food safety is a big part of that, but also because cooking to temperature guarantees the best results, better than me just going by feel and invariably overcooking things, haha. Best Gas Grills Under $300 – Inexpensive, Capable of Great Results!